Published: Dec. 23, 2018 at 09:15 p.m.
Arizona Cardinals wide receiver Larry Fitzgerald tosses his first ever touchdown pass to running back David Johnson. Published: Dec. 16, 2018 at 01:28 p.m.
Arizona Cardinals running back David Johnson bulldozes through Atlanta Falcons defenders for 1-yard touchdown. 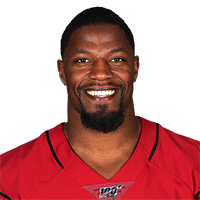 Published: Nov. 18, 2018 at 06:44 p.m.
Arizona Cardinals running back David Johnson turns on the jets for a 53-yard run. Published: Nov. 11, 2018 at 03:02 p.m.
Arizona Cardinals running back David Johnson forces his way into the end zone for a 1-yard TD.